Cordis solutions attended SAP Sapphire in Orlando the premier annual SAP event with over 20,000 attendees from around the globe and a further 80,000 on line participants. As guests of Microsoft and the SAP Microsoft Unite Partnership and we spent all 4 days on their stand. The event was held in the Orange County Conference Centre and was a full 4 days of presentations and meetings with prospects, with partners and with potential customers. We also had one of our Partner’s, Velocity at the event and we spent time meeting with them and educating their sales force on our range of solutions. 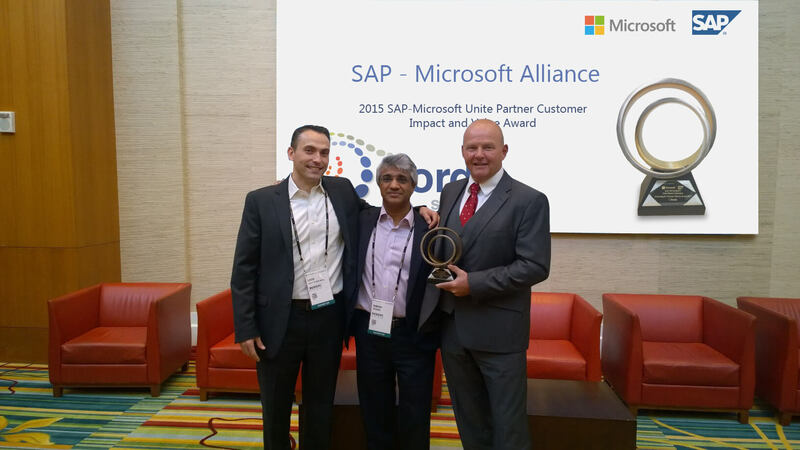 One of the highlights for us was the award of the 2015 SAP-MICROSOFT Unite Partner Connection Innovation Award. This was held as part of the SAP-MICROSOFT Executive Breakfast held on the 6th May attended by over 150 people. We were able to present our solution and an overview of Cordis to the audience and we met with a number of interested customers and partners as a result of this. Both SAP and Microsoft have additional executive and sales teams engaged and a new emphasis on Gateway for Microsoft and Mobile Applications available ‘out of the box’. We are well positioned to take advantage of this additional business through both the SAP and Microsoft Channels and with our track record and excellent customer base we are looking to add new customers and partners as a direct result of meetings held at the event..